characteristics: Vincinity of Skalica offers many attractive treats, not only cultural remains and long lasting wine making tradition, but many people are attracted thanks to the natural beauties of this region. 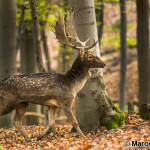 On the boundaries between Záhorská nížina lowland and Biele Karpaty (White Carpathian Mountains) nature creates ideal conditions for the populations of fallow deer. 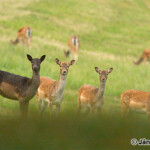 Fallow deer numbers are very abundant here and thus quite easy to observe and even photograph. 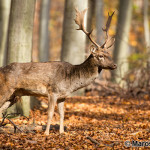 Besides fallow deers, forests around Skalica offer shelter to roe deers, wild hogs and deers. Among predators that lurk in the shadows, most common are fox, badger, stoats and martens. Important notices and conditions of game observing: We do not recommend children under 12 years of age to participate on this program. We also do not recommend participants to be accompanied by dogs. Terrain is of average difficulty with length of approx. 10 -12 km. After the initial briefing, it is absolutely necessary to be as quiet as possible, walk light-footed and very carefully. 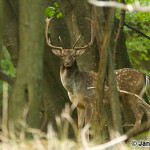 We recommend wearing camouflaged or less visible, non-rustling attire, ideally of brown or green colour. Red, yellow or any highly visible colour clothing is not recommended at all. Please, bear in mind, that early morning forest tends to be wet, so having sturdy walking boots suitable for forest walks is highly recommended. 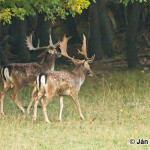 Departure from Bratislava is set to early morning because of higher fallow deer observation probability. In case of bad weather, it’s necessary to bring water repellent, non-rustling clothes. 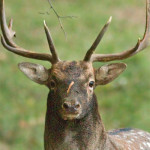 Meeting at 5:30 am, transfer to locality, entering the forest at about 7:00 am, slow walk (10 km) on wood paths of various degree of quality with short stops and walks deeper into the forest for fallow deer observing. Arrival to minivan at approx. 12:00 pm, return to Bratislava at approx. 2:00PM. 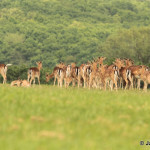 Ideal time for fallow deer observing is early morning or late afternoon. We will meet in early morning hours and transfer to the locality. 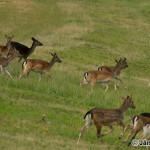 Slow walk towards the fallow deer rut places. 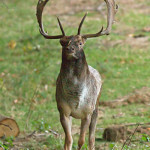 Fallow deer rut watching and photographing (morning hours). Short transfer to Skalica city centre, short individual lunch break and city tour (st. George’s Rotunda, Cultural house of D. Jurkovic, Jesuit church and monastery, Parish church of sr. Archangel Michael, Calvary, city walls and many more). Return at about 2:00 pm. Arrival to Bratislava at about 3:00 pm. Tour operator has all rights to make any small changes of program responding to actual animal occurrence or actual terrain conditions. The deadline for registration and payment is September 16, 2019. Please send the application forms to info@watching.sk, you can contact us also at +421 948 495 111.